In Saint-Maximin-la-Sainte-Baume, a little town in the southeastern region of France, there is a grotto and a medieval basilica that attract thousands of pilgrims each year. These people believe that the cave, known as La Baume of Mary Magdalene, holds the bones of Mary Magdalene. According to tradition, Mary, her brother Lazarus, and Maximin (one of Christ’s seventy-two disciples) fled the Holy Land after the execution of St. James in Jerusalem. After escaping in a boat without sails or rudders, they landed in France at Saintes-Maries-de-la-Mer. When the three arrived in Marseille Mary began to preach and converted the local people. For the last thirty years of her life Mary lived in a cave in the Sainte-Baume mountains and was buried in the town of Saint-Maximin. 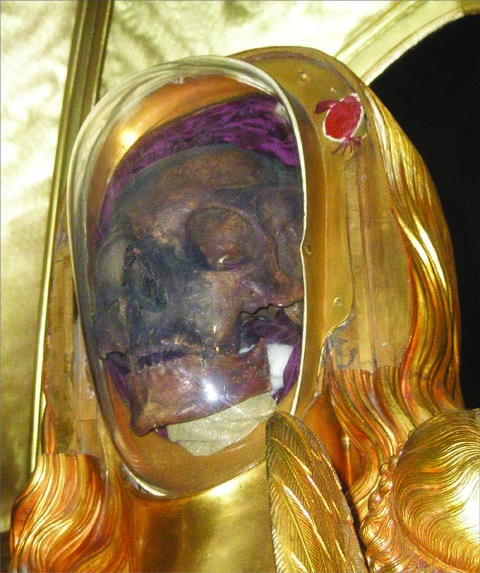 The skull of Saint Mary Magdalene at the Basilica of Saint Mary Magdalene in St. Maximin-la-Sainte-Baume. Image Credit: Magdalene Publishing. The mandible was located at St. John Lateran in Rome, where it had been venerated, and it was reunited with the rest of the body on April 6, 1295. Charles the II founded the gothic basilica Ste. Marie-Madeleine in 1295 and the priory at Sainte Baume. The basilica received the blessing of Boniface VIII, who placed it under the order of the Dominican monks. Though construction of the church was started in 1295, it wasn’t completed until 1532 because of the devastation caused by The Black Death. Every year a mass is held in honor of Saint Mary’s feast day, July 22nd. Before the mass, people parade though Saint-Maximin-la-Sainte-Baume in costume with flutes, drums, rifles, and horses. After the mass, there is a procession of the relics of Mary Magdalene, including her skull. Pictures of the skull can me seen in many places, here are a couple of links: Magdalineage and Morthouse. La Baume (French for “cave”), not La Baum. A minor lapse that, of course, does not diminish the value of your post. How did you get the photo? Thank you for catching the type-o. I did indeed miss the “e” in a couple of places. I found the picture on Flickr but the link to the original is no longer working. So I’m going to take it down until I can find it again. I’ll link to some other great pictures of this site. no pics or report with your national geographic link. Others are untrustworthy links. Thank you for letting me know. I deleted the National Geographic link. I tried the others (Wikipedia, Magdalene Publishing, and Atlas Obscura) and they seem to be working when I tried. I’ll try them again later from a different browser. Women empowerment in Provence. Who was Mary Magdalene? | Women Empowerment. Creative Life Coaching.